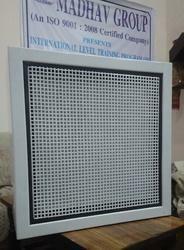 Providing you the best range of fan filter unit with effective & timely delivery. ØMotorized air filtering equipment used to supply pure air to cleanrooms , laboratories , medical facilities or micro-environment by removing harmful airborne particles from recirculating air. ØMADHAV FFU contain their own Pre-Filter , HEPA Filter & internally controllable fan air distribution. ØClass:- ISO Class-5 ( Class-100) ØAir Velocity:- 90FPM ± 20% ØSize:- 4×2 (Feet) 3×2 (Feet) 2×2 (Feet) OR as per customer requirement. ØCan be used in place of a more conventional recirculating air unit such as a ducted or plenum air system. ØOften used because of height restrictions in the space. Looking for “Fan Filter Unit”?